Portrait at Dennys, ballpoint pen on notepaper. 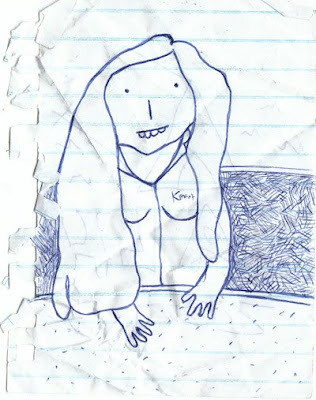 This is a portrait of Amy, drawn in my notepad not so long ago. It is startlingly accurate (especially the teeth!). I started drawing it just after my coffee arrived and finished it just before my two $2 breakfasts arrived. They were greasy and deliciously cheap, which is good because usually at Dennys they give you the Greasy but forget the Deliciously Cheap- arguably the more important part.